Beadie animals, pony beads, sun catchers. Wow! What choices we have for projects for children/teens. We fell in love with a beaded tiara on the Making Friends.com site. Here is our version using all pony beads. We think this would be a great project for Jewish Sunday schools and even preschool (with help) for Queen and King Purim Crowns. We really liked using sparkle beads at camp. For these pictures we used glow in the dark beads. (perfect for the night of Purim) The king's crown is our own design. These crowns were a great hit at camp. The assistant counselors and others all wanted to make one for themselves! To see general directions for other bead crafts including beadie animals see my Beadie Animal Page. 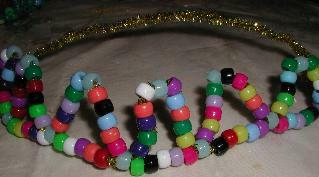 To see more of my original designs see my Jewish and Bible Bead Projects.and Toy designs (Pikachu and Furbies etc. ) on my Pattern page.. Check out the Day and Night Beaded Bracelets and Bracelet/Key chains. Can also me used for holidays like Mother's Day or Israeli Independence by changing the colors. This is the first step by step pictures using my new digital camera! Hope you like it. We picked glow in the dark and dark blue beads. White and Dark Blue are the colors of the Israeli flag. We picked glow in the dark instead of pure white since most boys think ( and girls) that glow in the dark beads are great. Also it will look great at night when we dress up for either Purim or Halloween. 5 Chenille Pipecleaners. (gold, silver etc. tinsel pipe cleaners. )We used 6 for a large head. 80 full size glow in the dark pony beads (G). Take 2 pipecleaners and twist the two ends together to make on long stick. Row 1: I forgot to take a picture of rwo one!Thread beads on the pipecleaner in a pattern of 1B, 5G, B, 5G, B, 5G, B. Center the beads so they leave equal lengths of pipecleaners on each side. Row 2: Take a pipecleaner and neatly twist it near the first B bead. Thread the beads in the following way, using the Blue from the first row as markers. 3G, B, 3g, go through the blue in row 1, repeat that 3 more times. Twist the remaining pipecleaner neatly around the first row. Cut of extra if needed. Add another gold pipecleaner under the first blue bead of row 2. Twist neatly the end so it will not show. Row 3: 3G, B, 3G, pipecleaner through the next blue bead of row 2. 4G, B, 4G through the next blue bead of row 2. 3G, B, 3G. through the last blue bead of row 2.Twist the remaining pipecleaner around row 2 and cut extra. See picture above for adding next pipecleaner. Row 4: Twist another pipecleaner near first Blue bead of row 3. Go through that bead. Start adding beads, 4G, B, 4G through the next blue bead of row 3, repeat. Go through the Blue bead and finish off by twisting and cutting the extra. Take the first row's pipecleaners and twist the ends together to make a back of crown. The tinsel works like velcro to hold on the hair. Some children need a third pipecleaner to make the back longer. I did this project at camp. Therefore I had to come up with something for the boys. The glow in the dark beads are always a hit, especially with the boys. We often need a King's crown for Purim. So we improvised. Row 2: Add a pipecleaner through the first Blue bead of row 1. Twist the end neatly. String the beads: 4G, B, 4G, thread the pipecleaner through the next blue bead of row 1. Repeat 5 more times. (6 total) You will have to add another pipecleaner half way through by twisting them together. Take the ends of the first row of pipecleaners and twist to make the back of the crown. You may have to had another pipecleaner for larger heads. At a recent class for 12 - 3 and 4 year olds, I modified the crown. We gave out a bowl with 13 glow in the dark pony beads. We put a cookie sheet full of assorted colors of pony beads in front of a group of 4. Less to spill and to reach. We counted together 1 from bowl and 5 from tray 6 times. Then we did the same for the top of the triangles. With the teacher twisting in the extra pipe cleaners as needed. This crown worked for girls and boys.